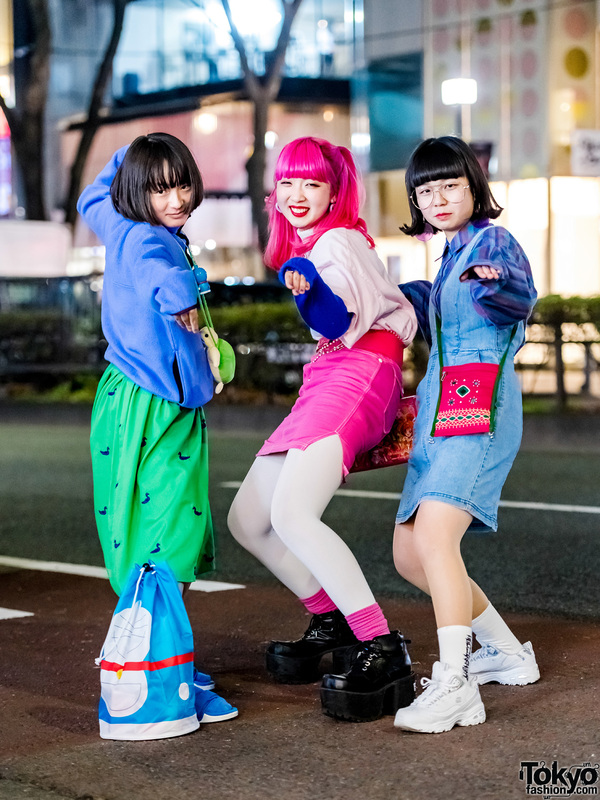 While out on the streets of the Harajuku neighborhood, we came across these teenage girls, whose interesting streetwear styles caught our attention. At the left is Nanase, whose green and blue street style features a blue turtleneck sweater, paired with a green skirt with dark blue contrast duck prints from Panama Boy. 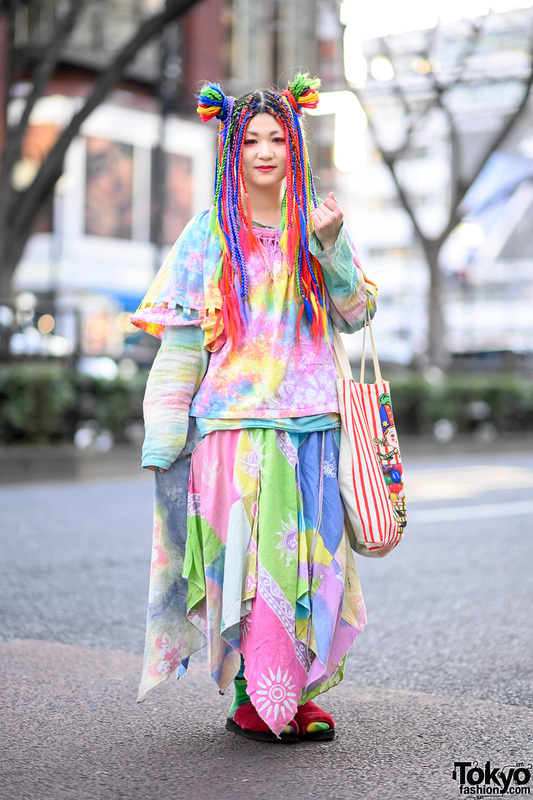 Blue striped socks, blue rubber sandals, and a Doraemon drawstring bucket bag completed the 15-year-old student’s outfit. 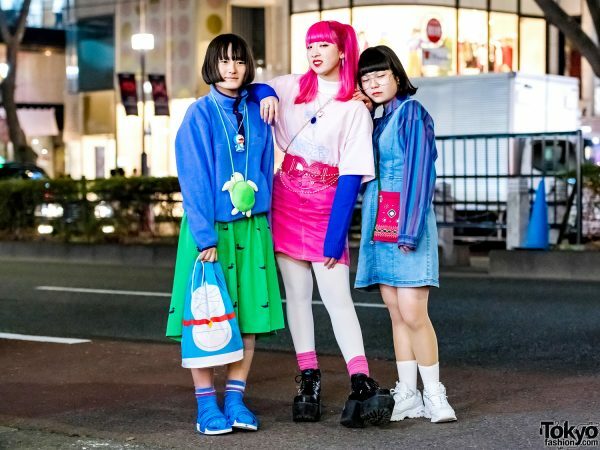 Her accessories – from Nakano Ropeway – include a Doraemon necklace layered with a green stuffed turtle neck purse. Kinji is Nanase’s favorite resale fashion shop, and she likes the music of Atarashii Gakkou No Leaders. Follow Nanase on Twitter and Instagram. At the middle sporting bright pink twin tails is 15-year-old Mawoni. She is dressed in a pink t-shirt, worn over a colorblock turtleneck sweater – from Honwaka Pappa and Oh Pearl – and tucked into a hot pink denim skirt from King Family. Pink socks over white tights, black platform Yosuke boots, a King Family x Smile Precure chain sling bag, and accessories from World Vintage rounded out her look. Mawoni loves shopping at resale shops, and she likes the music of Puffy. Mawoni is also active on Twitter and Instagram. Meanwhile, 16-year-old Yumi is dressed in a striped long sleeve shirt from Don Don Down on Wednesday, styled with a denim jumper dress from H&M, and paired with white socks and white sneakers from Sketchers. She accessorized with geometric pearl drop earrings and oversized eyeglasses – from Hekitora House – and she is carrying a pink and green embroidered sling bag bought in India. 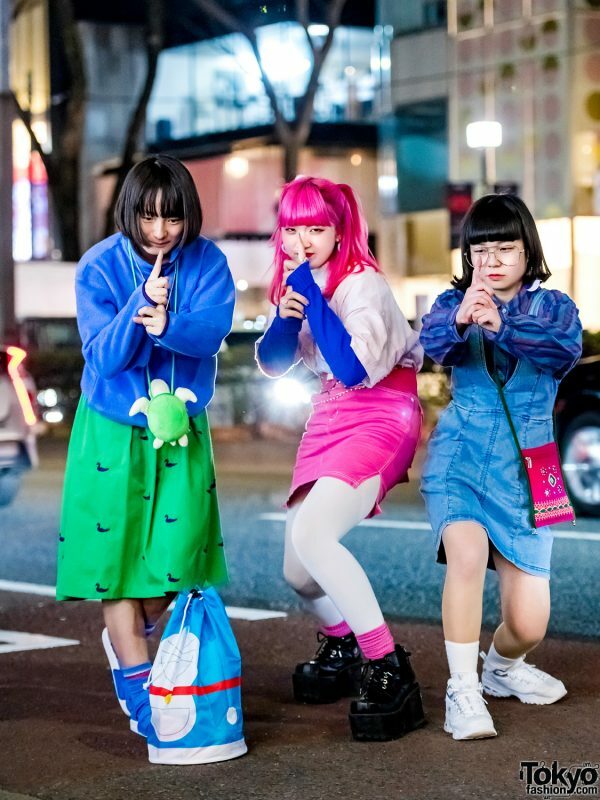 Yumi’s fashion favorite is Little Union Tokyo, and she loves the music of Yuuyami Ni Sasoishi Shikkoku No Tenshitachi. Check out Yumi on Twitter and Instagram.